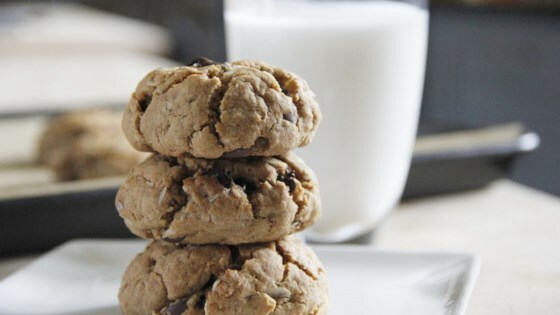 "There's never a wrong occasion to make a batch of chocolate chip cookies. It's been rainy around here lately and this was the perfect antidote! Be sure and invite friends over to share with you because it's hard to stop at just one!" Mix flour, coconut sugar, baking powder, salt, and cinnamon together in a large bowl. Whisk maple syrup, applesauce, coconut oil, and vanilla extract together in a bowl. Add to the flour mixture; stir until dough is well combined. Fold in chocolate chips, oats, and nuts; mix to incorporate. Scoop a scant 1/4 cup of dough for each cookie; shape into a ball and place on baking sheet. Gently press to flatten. Bake in the preheated oven until set and lightly browned, about 12 minutes. These cookies will not spread very much during baking. It was good. I needed to add milk though because it was to dry to put together. Might not make it again but it is a good treat. This were sooooo good especially for being gluten free and vegan. The best cookie recipe I've made.